To get to the Scarpelli mosaics workshop, Pierre Marie passes the serpentine and marble-clad Duomo, a symbol of stone’s defining importance to Florence. He is here to learn from Leonardo Scarpelli, a master artisan who works with stone in a way so refined that it’s described as painting with stone. Called commesso fiorentino, it dates to the Renaissance. The Paris-based designer at first senses a bit of apprehension about their joint project. But as Scarpelli shares his process – a marriage of art and ancient technique – and as Pierre Marie presents his work, they realize a surprising similarity. “In my drawings you always have a precise stroke that delimits a border between colors,” says the designer. Pierre Marie, born in 1982, is a Parisian designer with his own particular universe. His designs, which always combine narration with ornamentation, are characterized by the Baroque imagery of which they are composed and by his unique way of working with motif, which places him in the purest tradition of decorative arts. He is famous for the silk scarves he has drawn for Hermès since 2008, and also for his creations for the A.P.C. and Diptyque. His recent projects, including two carpets he created for Nilufar gallery in Milan, are all about objects, furniture and decor. He regards his participation in Doppia Firma, and his encounter with Scarpelli Mosaici, as a promise of beautiful projects in a new playground for years to come. Leonardo Scarpelli is a master artisan who practices the art of commesso fiorentino with his father, Renzo, who founded Scarpelli Mosaici in the 1970s. They are among a handful of artisans who uphold this special tradition of semi-precious stone inlay which dates to the Renaissance. In a gallery and workshop in the heart of Florence, they use ancient techniques and materials to make remarkably detailed and expressive stone paintings that are prized as framed art. Their work requires an artistic eye, a knowledge of geology, and a painstaking ability to cut, polish and glue the stones. 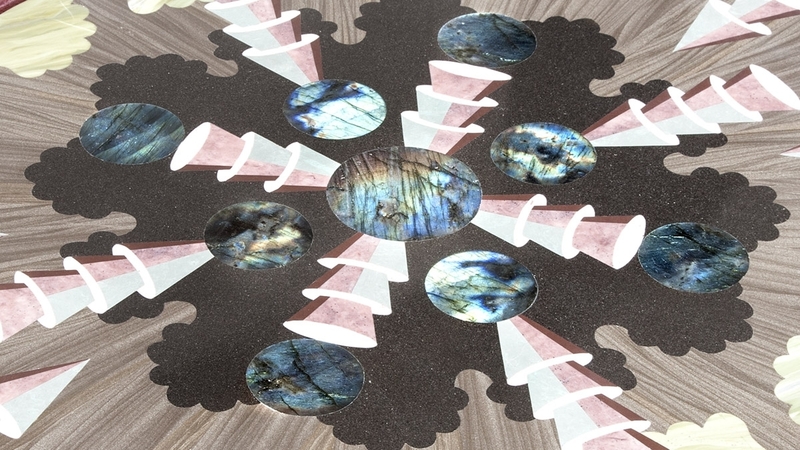 The atelier often realizes pieces for clients, and creates a range of other objects such as stone inlay tables.